Back home in eastern Kentucky, we didn't use a sponge or cloth to worsh (wash) our dirty dishes. We used a DISHRAG. They weren't a pretty sight, either. It didn't take long for those iron skillets to do a job on your new DISHRAGS and rub them into mangled, threadbare, remnants of their previous selves. Hmmm... makes me think of how I feel at the end of the day. I know my dad used a DISHRAG until hardly a thread remained attached to another. I reckon he considered it being frugal. I just know I lost a few fingernails that way. Iron skillets are rough on hands, too. I suppose that's one reason why I have a massive supply of DISHRAGS today. 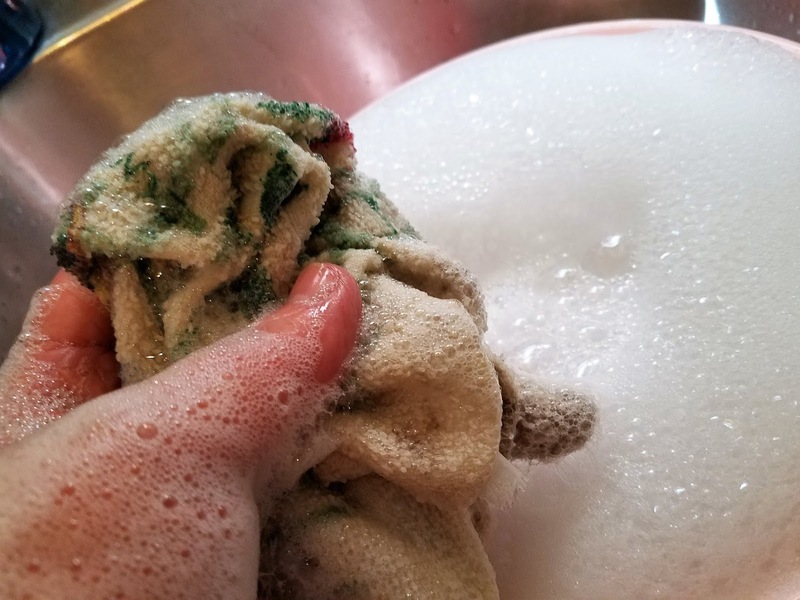 I prefer a fluffy DISHRAG that still looks like a DISHRAG instead of what you have to pull out of the drain so the water can flow properly. Periodically, I go through my exorbitant supply of dishrags and pick out any with stains or holes. Stains can be impossible to remove. I take all the imperfect DISHRAGS I would be embarrassed if anyone saw in my kitchen and use them for truly disgusting jobs. Hopefully, my dad approves of my continued uses. Ugly DISHRAGS are great for dusting, cleaning, and paint clean-up. They're also handy for dog or cat issues that need something stronger than a paper towel to scrub out of the carpet or off the sofa. For those incidents, you can simply toss them into the trash with no regret. A DISHRAG can save a life, too. When my brother was in junior high school, he received a chemistry set for Christmas. As he attempted to get a cork into an open-ended tube, Mom cautioned him, "You're gonna jab that thing right through your hand..."
Blood spurted through the tube every time his heart beat. When he saw it, his heart started beating even faster. We could tell. Mom grabbed some DISHRAGS out of the kitchen drawer, yanked the tube from his palm, and used the DISHRAGS to put pressure on the artery. She practically dragged him to the car and Dad drove them to the doctor. He lived through it--thanks to Mom's quick thinking and the DISHRAGS. She got a couple of new DISHRAGS after that, too. 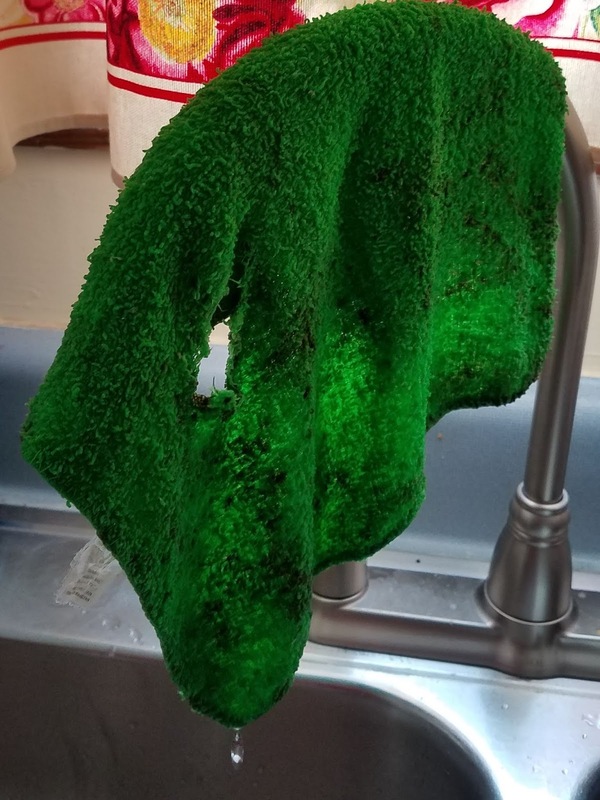 Even Dad didn't want to re-use the hero DISHRAGS. 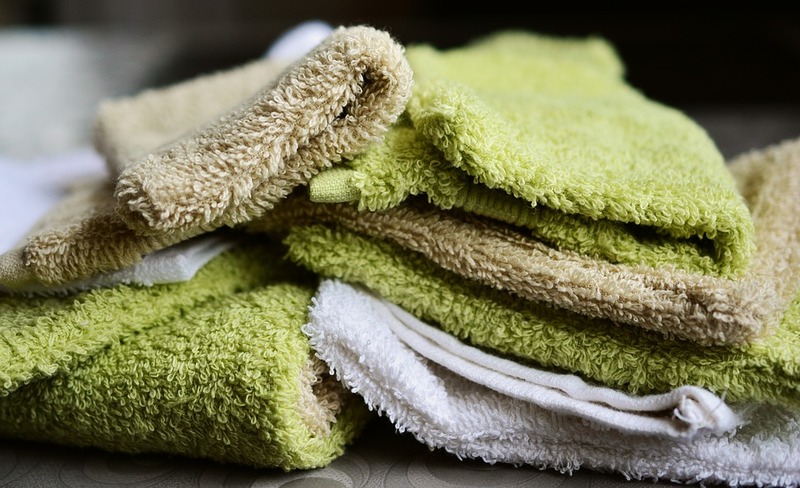 Did your family call them a DISHRAG? Or did you call it something else? What do you call them now? 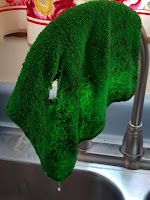 I'd love to hear your unique story of how you or your family used DISHRAGS. My uncle Junior's idea of GIMME SOME SUGAR was to clamp his fingers on either side of my knee and squeeze. When he hit the nerves in just the right spot, it made me scream--just as I thought I might pass out from the pain. I tried to hide from Uncle Junior. 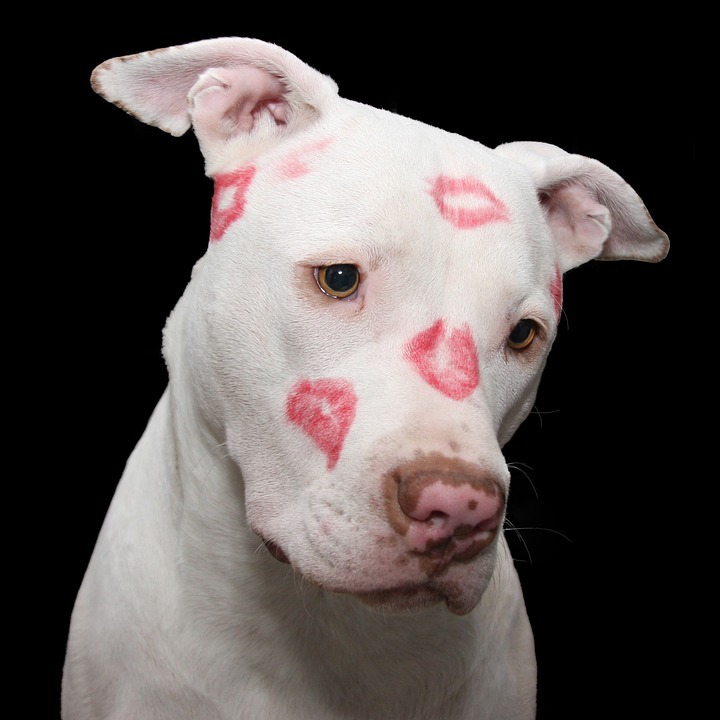 For most folks, though, GIMME SOME SUGAR meant they wanted a sweet little kiss on the cheek. I didn't mind when my mom, dad, or grandmothers requested sugar. They didn't gross me out or hurt me in the process. I did have a few relatives though who didn't understand the rules of GIMME SOME SUGAR. Aunt Georgie lived in Detroit. Thankfully, that meant she rarely came back home for a visit. I liked Aunt Georgie. She was a sweet person and I loved to listen to her half Detroit/half hillbilly accent. Unfortunately, her greeting of GIMME SOME SUGAR instilled dread in my young heart. Her sugar was so intense, it felt like she would bore a hole right through my cheeks. I looked in the mirror later to see if my cheeks had bruises. Then there are the relatives, usually older men, who smelled of cigarette smoke or had bacca juice oozing from their lips. They gave me brown sugar. Yuck. The most common victims of GIMME SOME SUGAR were babies. I felt sorry for them. My sister always cried. Of course, she cried about most things. Everybody seemed to get a thrill out of covering babies with sugar. Although the pain of the sugar could be intense, the worse part was the remnant of the attack -- red lip marks all over your face! That red lipstick especially was nearly impossible to remove. It had to wear off. Funny how most women who loved to GIMME SOME SUGAR wore bright red lipstick. As we reached our teen years, we developed a whole new attitude about the idea of GIMME SOME SUGAR. Suddenly, we had a list of people we wished would GIMME SOME SUGAR. Did your family use the term GIMME SOME SUGAR? Do you still use it today? Do you smother your grandbabies in sugar every time you see them? In today's political climate, we are inclined to use great caution before practicing GIMME SOME SUGAR--especially without giving the potential recipient the choice to opt out. Perhaps it is more appropriate to use words to express love or adoration to people outside our family circle. For me, I still like to hug necks and get sugar from special people in my life. As I get older, though, my list of people I want to GIMME SOME SUGAR has shrunk. How about you? Do you love to GIMME SOME SUGAR when you greet family and friends? We've had more than our share of thunderstorms here in Atlanta the past few weeks. My friends from eastern Kentucky have reported several days of heavy rains there, too. I brought back to mind the saying I often heard in Harlan, LORD WILLIN' AND THE CREEK DON'T RISE. Many a time, when someone made plans for an event in the future, the person who had to accept or decline the offer would respond, LORD WILLIN' AND THE CREEK DON'T RISE. Now, what in the world did they mean? Anyone who's had to depend on crossing a creek to get to anywhere else in the county knows exactly what it means. 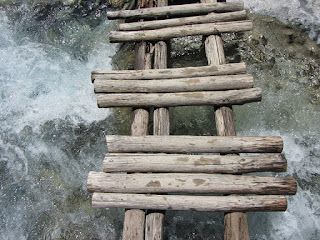 So does a person who had to cross a rickety footbridge over a creek. 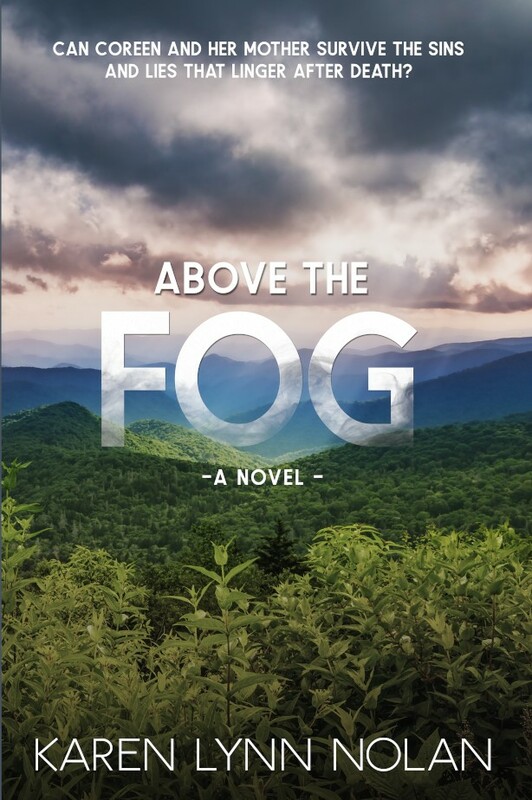 If heavy rains fall in the mountains, the water from the top of the mountain flows downhill quickly and joins up with the rest of the rains, eventually emptying into the creeks and streams. Those creeks and streams don't take long to overflow. 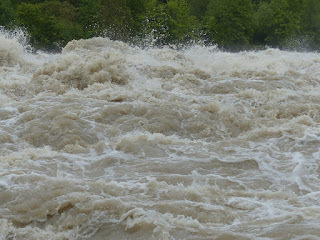 Not only do they contain more water, it is powerful water that has built up speed on its way down. That means it's dangerous to cross. 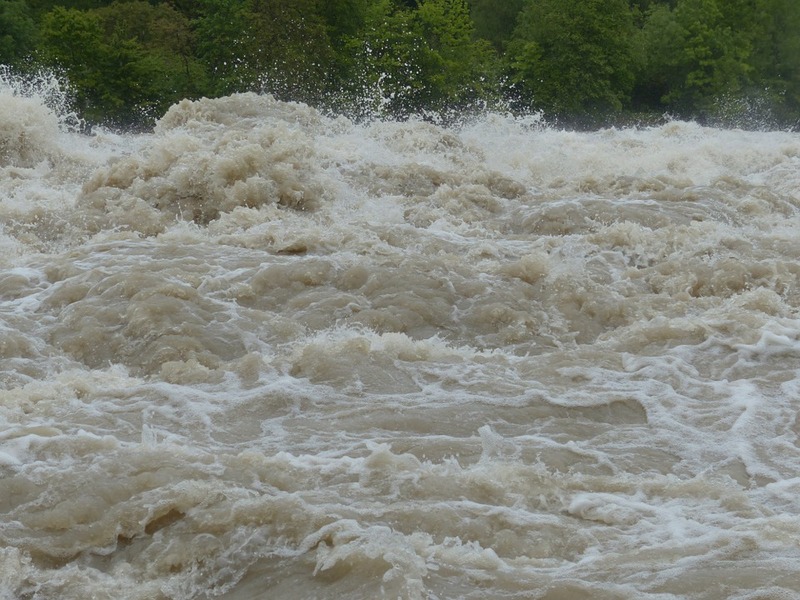 Most likely, you'd get knocked down and swallowed up by it as it drags you downstream to the river. That's why a person will only make the effort to attend an event if the creek is shallow and calm. 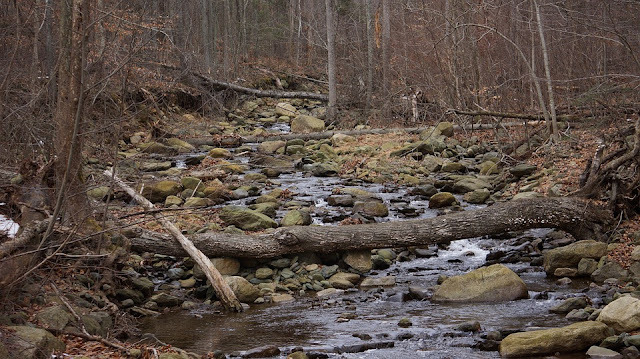 Have you ever attempted to cross an overflowing, fast-running creek or stream? How about trying to cross a footbridge when the water is flowing over top of it? I promise not to say anything negative about your lack of smarts if you tell me your story. Did you hear LORD WILLIN' AND THE CREEK DON'T RISE when you were young? Do you still say it? And don't forget the LORD WILLIN' part of the saying. I figured if the Lord was willing for me to go, he would make sure it didn't rain.